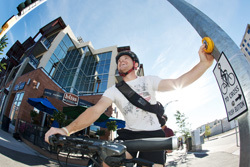 Kelowna is becoming more bike-friendly with additional changes being made to our roads to better accommodate cyclists. People on bikes and people in cars have the same rights and responsibilities on the road. Everyone needs to abide by the rules of road to ensure that we all get to our destinations safely and efficiently. Let’s move forward together and make our city safer for everyone! Introduced on Enterprise Way in 2010, green bike lanes are appearing on other major streets including Springfield Road. 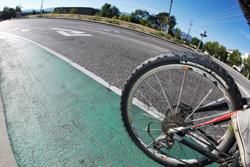 The solid green lane has been applied only to areas where cyclists and vehicles commonly interact, such as at intersections and on curved sections of roadways. 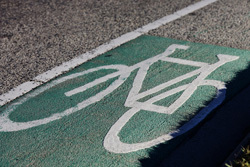 Green bike lanes create awareness for people in cars by reminding them to check for people on bikes prior to making a turn and that cyclists are to be expected on the road and to leave them their space. Green bike lanes provide people on bikes with a stronger sense of space and visibility. People in cars will continue in their lane as normal and follow regular traffic rules. Motorists are not permitted to cross into solid bike lanes, unless turning into (or, out of) intersecting roadways, laneways, driveways and parking – after following regular traffic regulations and it is safe to do so. Vehicle parking is not permitted in any bike lane. Watch this video to learn more. People on bikes can use the green bike lanes to provide separation from vehicles. View our map of our bike network. A bike box is a green box after the stop line and used for cyclists to wait ahead of vehicles during a red light giving them priority through the intersection when the light turns green. The bike boxes increase the visibility of people on bikes for all other road users and are intended to improve overall bike safety and intersection flow. Bike boxes at Richter and Sutherland were installed in 2013 and the intersection's traffic lights have also been equipped with bike detection. 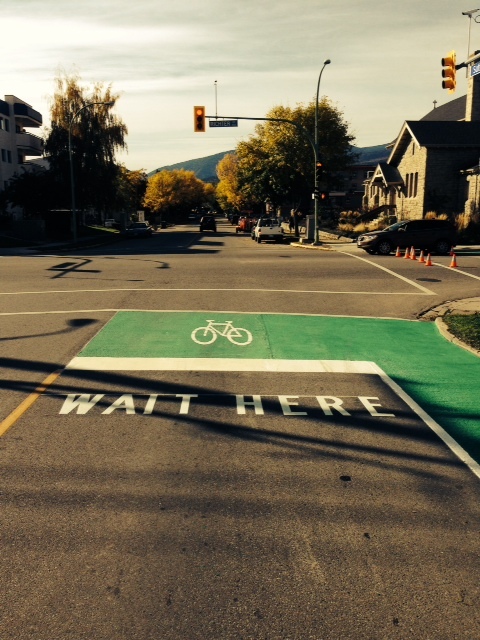 Red light: people in vehicles will stop as normal at the stop line, behind the green bike box. Vehicles must not stop in the green bike box – keep this area clear for people on bikes to use while stopped at a red light. Vehicles are not permitted to make right turns on red lights at intersections with bike boxes. Green light: people in vehicles will proceed, after the cyclists, through the intersection as normal. Right turns can be made following regular traffic rules by signalling and watching for oncoming vehicles or bikes. Red light: people on bikes intending to turn left will move into the green bike box and stop. Through cyclists will stop within the green portion of the bike lane or the right side of the bike box. Right turns can be made following regular traffic rules by signalling and being aware of other cyclists and vehicles. Green light: people on bikes will proceed through the intersection as normal following regular traffic rules. 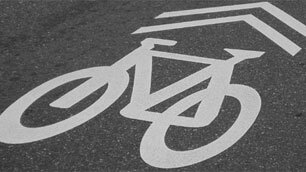 A sharrow indicates where cyclists should be positioned when in a shared lane. Sharrows are typically found on a roadway with lower travel speeds, lower traffic volumes or within town centres that do not have formal bike lanes. Sharrows provide the space needed to separate cyclists from parking zones and motor vehicle travelling lanes. They also serve as a reminder to motorists that cyclists will be in the same lane and to be expected on the particular corridor. People in cars must respect the space required for people on bikes to travel safely. Remember that cyclists are allowed on all roadways and they have the right to use the vehicle travel lane. Be cautious when parallel parking on roadways – always shoulder check before opening your door. The sharrow indicates where cyclists should generally position themselves while sharing the roadway with other vehicles. Be cautious of and courteous towards motorists and most importantly, obey the rules of the road and be predictable. Try to leave space between yourself and parked cars in case of opening doors. A cycle track is a protected bike lane that has a physical barrier from roadways and sidewalks. They can be either one-way or two-way and can be located vertically at road level or raised to be at the same level as pedestrian sidewalks. They make the street safer for all roadway users and more predictable for people who walk, bike and drive. Motorists will continue in their lane as normal and follow regular traffic rules. Motorists are not permitted to cross the barrier separating the cycle track lane. Vehicle parking is not permitted in any bike lane. Cyclists are to use the cycle track to provide separation from vehicles and pedestrians. View our map of our bike network. Similar to a pedestrian crossing and its “walk button,” at bike crossings there are bike signals to indicate when it is safe to cross. The bike signals have a specific button that is conveniently located on the pole to allow cyclists to stay on their bike while triggering the signal. Elephant feet are found on either side of a crosswalk, and in many cases the area is painted green. These allow cyclists a safe area to cross a street without dismounting, while not impeding on the the pedestrian’s crossing space. Each of these treatments allow cyclists to travel more efficiently along a corridor ensuring their trip time is reduced. As with all intersections, motorists must follow regular traffic rules, and be cautious of cyclists and pedestrians when making right turns. Cyclists do not have to dismount to cross in these intersections - unlike at a traditional zebra print crosswalk. Cyclists still must obey all the rules of the road and only cross when permitted and is safe to do so. The same vehicle detection system that recognizes when a car is at an intersection is now able to detect you and your bike helping to trigger the green light so you can be on your way - without having to push the walk button or wait for a vehicle. We are upgrading various detection technologies that accommodate bikes at select intersection to test their effectiveness. It’s just another way we’re helping cyclists keep their tires rolling. Ride up to the intersection as you normally would stopping at the stop line within the bike lane or travel or turning lane. Wait for the signal to change to green. The system does the rest.